Saturday, October 1, 2005, looked like the beginning of a beautiful fall day. 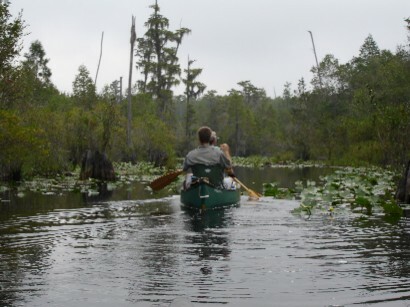 The Fellow T ravelers had obtained a permit for three-day trip through the Okefenokee Swamp. Originally ten persons had been scheduled, but various excuses left only a three-man crew of Hamp Chauncey, Donald May, and Charlie Stines. The trio met at Stephen Foster State Park for an early morning start. The trail was partially virgin territory to the Fellow Travelers. The first leg of the trip was from Stephen Foster to Floyd's Island. This section is usually a part of the trip, but in reverse order. The second leg was a short jaunt from the island over to the Canal Run shelter, a distance slightly under four miles. 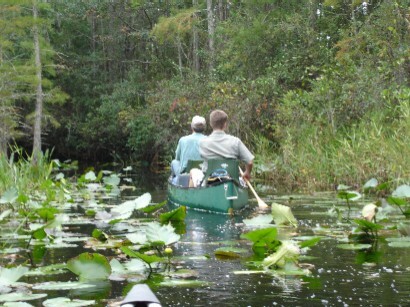 But the third day was supposed to be the new and tough part, canoeing the remnants of the Suwannee Canal from the shelter to Billy's Island and on to take-out at Stephen Foster. The guide books and Walter Wiggins describe it as nearly impassible and not particularly scenic. Hamp, Donald, and Charlie have a different perspective and truly want to do that section of the orange trail again. To anyone who had done the Sopchopp y, Econfina Creek, or the Satilla, this trail was mild in comparison. Charlie and Donald rode over in the Suburban Profane and arrived at the park about 7:40 AM. Hamp was already there. Hamp and Donald paired up in the Gunn Boat (Penobscot 17) and Charlie got to solo in his once red Wenonah Prism. The boats were not heavily loaded for a change. The trip was underway by about 8:15, and there was a threat of rain despite very optimistic weather forecasts. Although it was a Saturday, the state park was nearly deserted. The first leg of the trip traverses Billy's Lake, and it was a scenic wonder in the autumn morning mist. The a lligators were mostly in hiding. 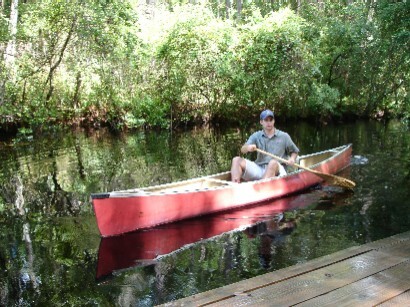 Once off Billy's Lake, the trip winds through the Middle Fork Run of the Suwannee river. This is one of the prettiest parts of the swamp as the trail meanders through tall cypress trees reflecting into the black tannic waters. It began a soft rain shortly into that run, but it was not enough to dampen the spirits and only slightly dampened the clothing. Hamp spotted a small gator just a little way up the trail. The first stop was at the Minnie's Lake day use shelter. It was too early for lunch, but the group did get out and stretch. Last year the floor of the shelter was slightly under water, but this time the water levels were close to normal, and there was a slight climb onto the shelter. Minnie's Lake is prettier than Billy's Lake. The huge cypress trees line the shore, and the tickweed's yellow flowers and the white fragrant water lilies surround the bases of the trees. 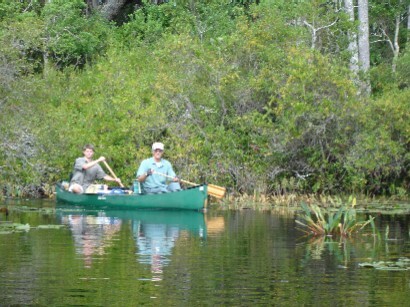 The lake is wide for a swamp trail, and the paddling th rough the trail is especially easy. There were several alligators lazily enjoying the morning sunshine. In spite of the occasional showers, the sky was at its bluest best. Just at the end of Minnie's Lake the paddlers encountered four men who had just come from spending the night on Floyd's Island. They gave a good report on island conditions. This group was the only people encountered until getting within a half-mile of the take-out on Monday. The gang departed Minnie's Lake about 10:45 and headed along the green and red trails to the point where the trails separate. The red trail continues on toward Big Water, and the green trail turns east toward Floyd's Island. This section of the trail has some open water which is generally shallow and also goes through a forested canopy of mainly hardwoods. It opens into a fairly large passage for some distance before the trail junction is reached. The turn-off to Floyd's Island came at about 11:30. The temperature was rising, and the weather was humid. Still, it was a grand day for canoeing, and the scenery was outstanding. After about thirty minutes, many birds could be heard but were mostly out of sight. There were some wood ducks, ibises, great and little blue herons, and the usual songbirds which bring their music to the swamp. Shortly thereater, several endangered woodstorks were found. Some were wading in the swamp, and some were perched in the tops of cypresses. The birds were too distant for a decent photograph even with a 200 millimeter telephoto lens, so the real pictures will remain in the memories. The trail from the red trail junction to Floyd's Island is partially through Floyd's Prairie and partially through a canopied trail of a canal which was built to allow access to the island. The prairie section is generally one of the most interesting sections of the swamp for bird watchers, and is about as far east as one will ever spot a sandhill crane in the sw amp. None were seen this trip, but the distinct call of a pair was heard. Just prior to reaching the island landing there was a really big alligator basking in the mud up a little slough. The Fellow Travelers arrived at the west landing about 1:30. There is a better cart available now. It has spoked wheels and rubber tires, and is fairly easy to pull. The gear was loaded and taken to the cabin. Hamp and Donald carried the Gunn boat, but Charlie wanted to test his major award, an expensive Wenonah solo portage yoke. Carrying the Prism with it was not a totally fun experience, but perhaps with a little practice its proper method of use will be determined. The Hebard cabin really looks great now. Both porches have been replaced. 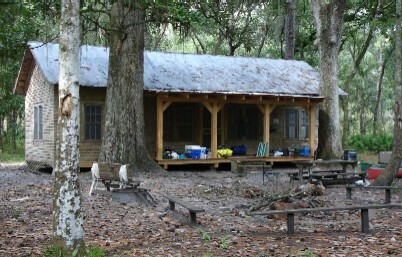 There are some additional benches and a table outside, in addition to the benches which surround the campfire area. The cabin was so inviting that everyone decided to sleep inside rather than pitch tents. Hamp brought a hammock which he tied between two trees and took a siesta. Donald and Charlie also sacked out for a spell. The yellow flies were there, and it took a lot of DEET to discourage them. Charlie brought a bow saw in anticipation of needing it for the third day of paddling, and it came in handy for cutting large limbs from a fallen oak tree. Hamp built two good fires, one for cooking and the other for just sitting around. Diane had prepared our supper which was ground beef, potatoes, onions, peppers, and carrots wrapped in aluminum foil. Although there was plenty of charcoal, the cooking campfire was so good that the meals were cooked there. It was a truly good camp supper, alth ough it probably would have been better had it cooked about ten minutes less. There were no dishes to wash. The campers did not stay up late. There were no rookies to initiate, and there were no notable lies told. Everyone settled in for a good night's sleep to he music of the barred owls. Charlie had to get up in the middle of the night, as men his age do. On returning, he sat down on the end (rather than the middle) of his roll-a-cot, tipped it over endwise, and broke the globe on the lantern. It was quite a noise, but everyone went back to sleep. It did come a substantial rain, but everyone was dry inside the cabin. Speaking of major awards, Diane had a couple more for the King. One was an LED headlight, and the other was an LED flashlight. They worked well, so there is little excuse for his sitting down on the end of the cot. Charlie bought himself another little major award, a digital tape recorder which is easily carried in a pocket and was useful for taking notes. No one arose before daylight, and that is about 7:00 in early October. The King made a pot of coffee, and Donald complained that it was a little on the strong side. Charlie drinks his coffee black and forgot to bring sugar for the others, so Hamp and Donald sweetened theirs with pancake syrup. Breakfast was prepared on the griddle by putting eggs, cheese, fried onions, fried peppers, and Canadian bacon on English muffins. It was good, but no one said it was better than the Egg McMoyes Roy prepares. There was very little clean-up necessary as only a spatula, the coffee pot, and the griddle were used. The trash was burned. The gear was loaded onto the cart, and the boats were carried to east landing. Charlie did not use his portage yoke. The two boats left the island about 10:15 AM. The first several hundred yards of the canal out of the island had its usual accumulation of leaves and muck, but soon the group was paddling down the canopied trail, battling spider webs and yellow flies. After reaching the open water the paddling was easy and there were lots of birds, including great blue herons and woodstorks. It was less than an hour to the junction of the blue trail which leads toward the Canal Run shelter, while the green trail goes to Bluff Lake. It is only a short paddle from there until the purple trail leading to Round Top is encountered. The paddlers continued the blue trail toward the daily destination. The blue trail is strictly a connector path joing the orange, green, and purple trails. It leads through Chase Prairie which teems with birds and alligators. Pitcher plants and water lilies provided pretty scenery. The weather still threatened rain, and distant thunder was heard. But the paddling was pleasant. Sunday was a bit cooler than Saturday had been. The paddlers made a wrong turn at one point and started down an obstructed canal. After a very short paddle, the group turned around to look for signs. It was then only a short distance to the Suwannee Canal and the orange trail, and from there it was probably not five minutes until the Canal Run Shelter came into view. That was about 12:15, so it was only about a two-hour paddle from Floyd's Island. It started raining within five minutes of getting the canoes unloaded and the gear under the roof. The Canal Run shelter has been totally rebuilt. The old shelter was only half the size of the other shelters and was totally covered. The new one is like the others being 10' x 28' and half covered. It is in excellent shape. Someone had taken duct tape and covered the "C" on the Canal Run shelter sign, but Mr. May did his civic duty and removed the tape. There were two resident alligators, probably a five-footer and a six-footer. They obviously expected to be fed, but they were disapppointed. Donald and Charlie took naps. The yellow flies were still a problem, and the insect repellant got heavy use. Hamp wanted to try his hand at the solo Prism and get a preview of the next day's tough canoeing, so he took out on his own while the elder statesmen napped. Hamp came back shortly and wanted the bow saw to clear an obstruction, and that was not considered a good sign. But he was then gone a long time, and when he came back, he said it was not a bad ride. Hamp then took the Prism and went out to watch the birds and alligators in the prairie. It came a light rain and then a heavy one. Diane sent a lot of charcoal--twenty pounds. Since none had been used on Floyd's Island, the entire lot was set ablaze. It rained a little more, but not enough to douse the charcoal. Supper was good--ribeye steaks, potatoes baked on the charcoal, and a salad. The King forgot to bring salad dressing, so the salad was eaten undressed. Again, there were almost no dishes to wash. The alligators waited hopelessly for leftovers. Everyone decided to pitch tents rather than simply sleep under the shelter. The yellow fly population weighed heavily in this decision. Donald discovered that his $125 Therm-a-rest mattress could not be located so he figured that the next group staying on Floyd's Island would inherit a nice major award. Everyone slept to the melody of owls and alligators and raindrops, and again it was daylight before anyone stirred. 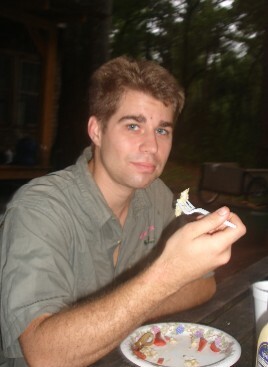 Charlie prepared another pot of coffee, bacon, and pancakes. It was a good breakfast, and everyone was anxiously awaiting the legendary bushwhacking on the orange trail. The tents were taken down, the canoes packed, and everyone was ready to leave before nine. Miraculously, Donald's mattress was found amongst the junk. The first two miles presented none of the problems expected. The trail is through hardwood brush and little daylight reaches the water, but obstructions were minimal. The group had covered two miles in about an hour. As the group approached a sharp bend the angry sound of a bull alligator filled the air. It was somewhat frightening, but the alligator turned out to be no more than a seven-footer. Still, he was reluctant to share the waterway with two boats. Eventually he bellowed one last time and slithered away. Some ot the trail opened up into grassy areas which were somewhat laborious to cross, but again the canoeing took no real skill. The group heard a loud thrashing in the woods which sounded much too lumbering to be a deer and was breaking much too much brush to be an alligator. The consensus was that it was a bear, but it was never spotted. Finally an obstruction was found. Donald first attacked the overhanging branch with the bow saw then with the machete. After lots of hard licks, the Donald lost his grip on the machete and it fell into the waist-deep water. 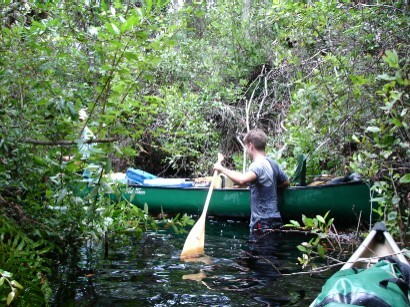 Hamp, being the young and adventurous lad, got out of the canoe and found the lost machete on the swamp floor. Hamp got back into the boat soaking wet. The machete was never needed on the rest of the trip. After a while, the trail emerged from the wood into a really grassy area which made paddling hard work. The grassy area gave way to a winding path through thick lily pads. The area was very scenic, and wildflowers of many varieties were everywhere. Bladderwort, tickweed, and black-eyed Susans lined the shore. The group spied a large alligator snapping turtle, and none of the three recalled ever having seen one in the swamp before. At about 12:15 Billy's Island dock came into view. The hard canoeing was done, and it had been more treat than task. The section is truly gorgeous. The travelers ate a snack at Billy's Island and then began the final mile and a half to the take-out. Shortly after leaving the island, the group spotted a mother alligator with her young ones. No one approached too closely. Several other alligators were seen as the last strokes brought the weary paddlers to the state park around 1:40. Diane arrived shortly afterward, the canoes were loaded, and the trip ended. And it started raining!